Christmas happened so I can show off the pieces I've been making as gifts. Above and below are knee socks for my mother. 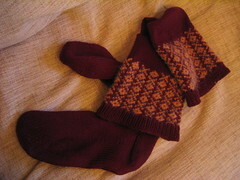 I did it toe-up, but with a flap heel (my own formula) and finished with a fair isle cuff. 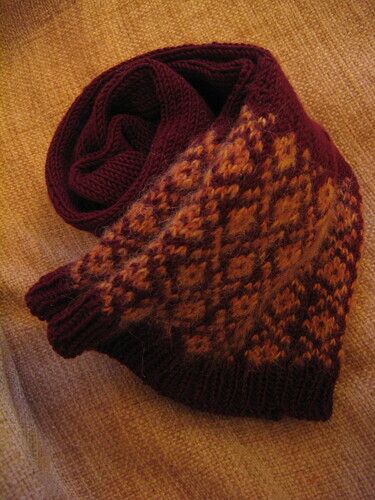 I used Jeagar extra fine merino 4ply with some leftover luxury tweed for the colourwork. 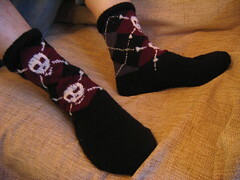 Then, for my brother, a pair of Aaargh-yles - perfect for the guy who wears a suit by day but everyone knows is a secret pirate. 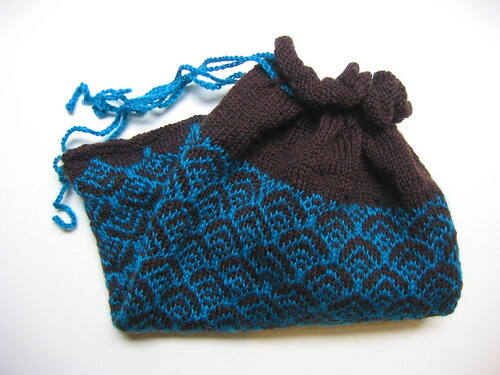 I used the chart and guide for knitting argyles from mothheaven. The black and white are both paton's wool rich 4ply, the red and grey are leftover extra fine merino from mum's socks and ones I made for my Grandfather last March. I also gave my mother a sock knitting kit of yarn, addi's, crochet hook and toe-up pattern (I decimal-ised knitty's universal sock formula). She sent me a text at midnight last night to say she'd swatched and was ready to fill in the gaps in the pattern. And this morning I had an extra gift in the shape of my final secret pal package, loads of sock yarn, with a fair isle pattern. She also revealed herself - Cassandra, from Philmont. She hasn't told me her blog yet though. SP9 still runs till the end of January, so I'm going to wait a bit before sending the final package the lady I'm spoiling, it's all set out though. All the packages I've sent have been themed - I've had so much fun working them out. For once, London actually looks like American tv says it should. We have fog! It's crazy and loads of people have been stranded at airports. You can see pretty pictures here. My flat had a dinner party on the solstice and a bit of early present exchange. 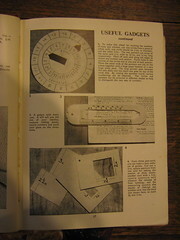 My flatmate gave me the Pictorial Guide to Modern Home Knitting! 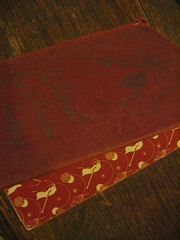 It of the famous endpaper. I gave Alexis the scarves/ headband things which were a runner up in the Knitterati competition. She emailed us when she started school in LA to say the air conditioning on buses was so strong she wanted a scarf (even when you're still sweating from how hot it is outside). 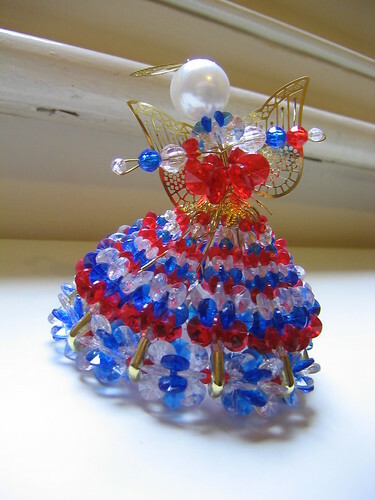 This design, called "frillybits", hopes to help her. A hair band which doubles as a neck warmer; something to aid sweaty head or cold neck. 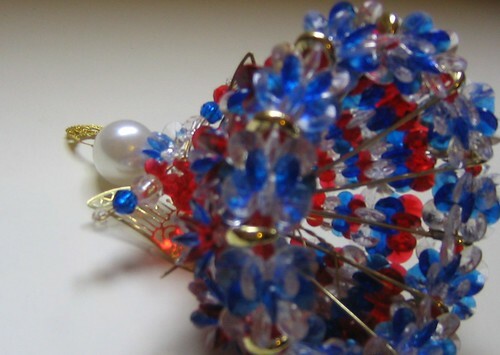 It can also be tied round your thigh, if you are so inclined, or worn as a bracelet. It employs a crossed stitch effect, similar to the one I used in the tie of the hotwaterbottle cover, which makes a nice alternative to eyelets. I also think it'd make a great cuff pattern on a sweater. I've written up the pattern here. 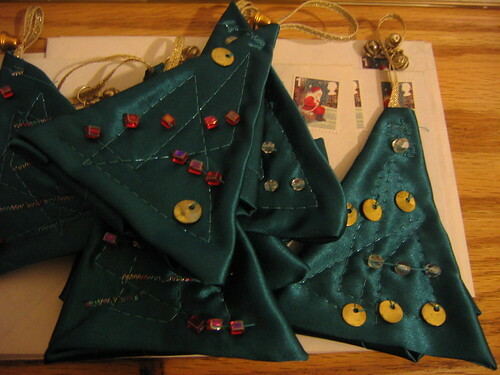 Seasons Greetings to all, I'll leave you with a photo of some of the Christmas "cards" I sent this year (they are tree decorations). You can also see the UK Christmas stamps - doesn't Santa look like he's doing a poo down the chimney? I felted a swatch of the the fair isle project I was working on. 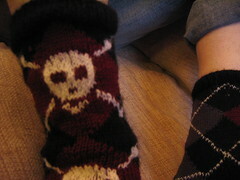 It didn't felt that evenly, so a lot of the colourwork pattern was lost. Plus all the green went out of the turquoise yarn - a plain blue just wasn't the same. So I decided the fabric would have to be kept un-felted and, after taking a few measurements, realised it would make a perfect hotwater bottle cover. My mother, who doesn't have my issues with wool. has just moved house, so it was an ideal housewarming present. I sewed up the cast-on edge. I'd started it with a few rounds of garter stitch, hence the odd edge. For the top, I shifted to working just in brown and decreased a few sts evenly around. Then, after a few cm of st st, I worked a couple repeats of a cross stitch pattern*, through which I run a crochet-chain of the CC as tie. The friction between the yarns means the tie bunches up very neatly. The book I found the fair isle design in was from Marion, who was my SP last spring. 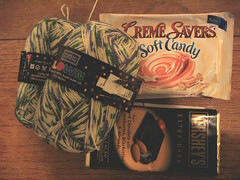 The yarn was a thank you gift from Veronique, who's SP I was. I'm pleased I managed to match them. * This is similar to the stitch pattern I used in my knitterati entry - I'm going to post the pattern for that in a few weeks. 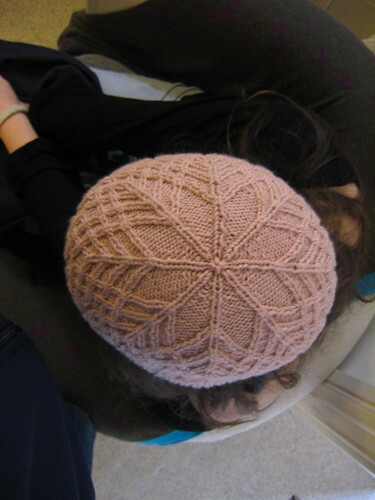 Pattern: Shedir from the Knitty breast cancer print edition, downloadable here. Yarn: two skeins Debbie Bliss cashmerino dk (I have about two thirds of a ball left). I know cashmerino will pill like crazy; not the best for cables. But I don't care. I can't take wool and it matches a scarf I wear all the time that's knitted in the aran weight version. Needles: 2.75mm addi circs, using magic loop. That is two sizes down from the suggested ones and crazy small for dk weight yarn. I knit loose. I did the whole thing without a cabling needle. Following Eunny, I only did three repeats of the main braid pattern instead of five. 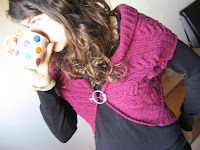 I thought about twisting the knit stitches too, but am feeling a bit "over" the twisted rib at the moment. I wish I'd done a better cast on. 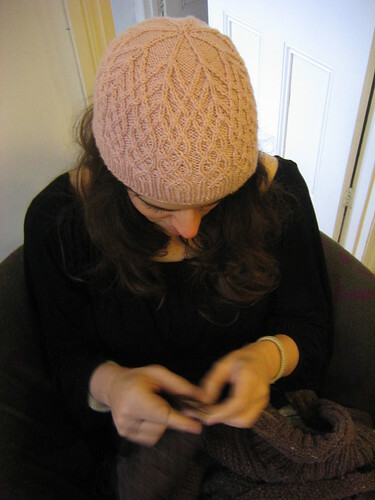 I was feeling particularly grumpy when I started it, and just worked knit-along for speed. Cable would have looked much neater. I know I said I'd stop knitting breasts... It is a breast, and not just because it's pink. Shedir (the title of the pattern) comes from an Arabic word for breast. The pattern notes say to try google if you want to know the title's meaning. Of course, knitting's web presence being what it is, I needed to do a few layers of searches, filtering "hat, cap, knitting, knitty, knit". I just need to keep hold of this hat. No small feat in the current climate. Yes, a tornado in London - just down the road from my old school. My mother only lives the other side of the park, she was pretty lucky. And I've swapped to BloggerBeta. Hence the lables. I've inherited some furniture from my Dad's office. 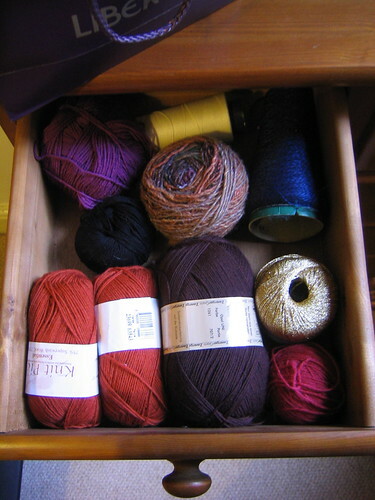 I now have a chest of drawers of my very ownsome, and my yarn can have a nicer home than a cardbox box. I'm really pleased to say it easily fits into a small drawer. I admit this is partly due to the number of WIPs I have the moment (I've completely broken my two projects at a time rule...). As long as I don't start thinking I can buy more yarn, just because I have the extra storage space. I don't like having a stash. I don't like having a pile of unread books either. Having unused "stuff" makes me feel guilty for unneccesary consumerism. Moreover, it's like an overflowing "in tray", which makes me nervy. I have enough of that with the horribly nebulous deadline of the PhD thesis*. 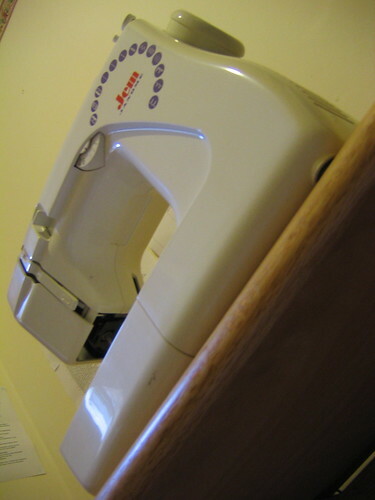 The really dangerous thing that arrived was my sewing machine. My 18th birthday present back when I was doing A-levels and dreaming of undergraduate life in Durham, sewing all my own clothes (etc etc). Except then exams arrived and I didn't really have time to learn how to use it. And I didn't go to Durham, I got a job. It's been at my parent's place for years, being guilt-inducing "stuff". But now I've got it back and I will put it to use. As long as I don't end up having to clear a drawer for fabric. *UK grad school - hey, nice to meet you, come back in three years with 100,000 words. Go, use the libary - it's open 24 hours and has a coffee machine. (n.b. I am lucky and have a really supportive supervisor, but we do just get the one massive deadline, which is nice, we have freedom, but can hang over you somewhat).